The Therapeutic Apheresis Academy is a multidisciplinary 2½ day course for physicians in nephrology, hematology, pathology/blood banking, and other allied health professionals with an interest in therapeutic apheresis. This conference will build upon previously established interprofessional learning using modern learning techniques. The interactive didactic sessions will present an overview of current practice and information on building a new therapeutic apheresis service. The small group and fully interactive demonstration workshops will showcase clinical applications and provide an opportunity to glean practical tips from expert practitioners. ADQI cropThe Acute Dialysis Quality Initiative (ADQI) was established in 2000 to provide a framework for developing consensus-driven, evidence-based recommendations for the treatment and care of acute kidney injury (AKI). The ADQI developed the first uniform criteria for classifying AKI — “RIFLE” (Risk, Injury, Failure, Loss, and End-stage kidney disease). ADQI-sponsored international conferences have been held on an annual basis since 2001, with the thirteenth hosted by the UVA Division of Nephrology in April 2014. From year to year, UVA Nephrology faculty have played a key role in defining and developing the working agendas for these conferences. The focus of ADQI XIII Consensus Conference, held at the Boar’s Head Inn in Charlottesville from April 11-13, 2014, was “Therapeutic Targets of Human Acute Kidney Injury: Harmonizing Human and Animal Acute Kidney Injury.” The meeting brought together leading investigators in basic, translational and clinical acute kidney injury, along with representatives from industry and government agencies such as the NIH and FDA that are responsible for biomedical and health-related research and public safety, to foster public-private partnerships for promoting kidney health. Through such meetings of AKI stakeholders, we believe that rapid advancement in the identification of relevant therapeutic targets can be made and tested in appropriate clinical trials. Murray PT, Mehta RL, Shaw A, Ronco C, Endre Z, Kellum JA, Chawla LS, Cruz D, Ince C, Okusa MD; ADQI 10 workgroup. Potential use of biomarkers in acute kidney injury: report and summary of recommendations from the 10th Acute Dialysis Quality Initiative consensus conference. Kidney Int. 2014 Mar;85(3):513-21. doi: 10.1038/ki.2013.374. Epub 2013 Oct 9. Okusa MD, Davenport A. Reading between the (guide)lines–the KDIGO practice guideline on acute kidney injury in the individual patient. Kidney Int. 2014 Jan;85(1):39-48. doi: 10.1038/ki.2013.378. Epub 2013 Sep 25. 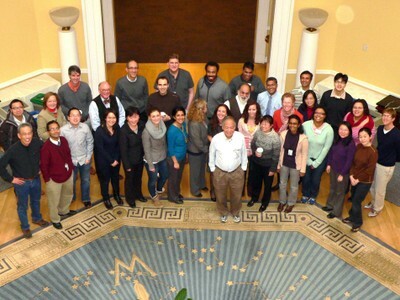 The Division of Nephrology and the Center for Immunity, Inflammation and Regenerative Medicine held a research-focused, one-day retreat on Grounds for its faculty and fellows in January 2014, with presentations by many of its principal investigators. New collaborative partnerships were nurtured, and plans developed to strengthen the infrastructure of the clinical research enterprise, including the establishment of a kidney tissue repository and database. The retreat also helped facilitate work groups in thematic areas that may, eventually, lead to new collaborative research grants and projects.